The US government will continue its military intervention in Iraq and Syria indefinitely while ramping up its “counterterrorism” operations both overseas and within the US, President Barack Obama made clear in public remarks at the Pentagon Monday. Flanked by a phalanx of military officials and commanders, Obama outlined a perspective of endless war in Iraq, Syria and beyond in a speech delivered after closed-door meetings with top military officials. Nearly a year after its launch, Operation “Inherent Resolve,” originally presented to the American people as a temporary and limited action, has become an open-ended war stretching across large parts of Iraq and Syria. The Iraq-Syria war, which has already involved some 5,000 combat sorties by US and allied war planes and the return to Iraq of thousands of US troops, is part of what Obama called a “generational struggle” against “violent extremism,” to be waged without any timetable or geographical limitation. “This will not be quick. This is a long-term campaign,” Obama said. Obama’s remarks came in the immediate wake of some of the most intense bombing of the entire campaign, with US and allied war planes launching some 40 strikes against targets throughout the Iraq-Syria war theater over the weekend, including heavy strikes on ISIS’s self-proclaimed capital at Raqqa in Syria, as well as strikes against the Syrian cities of Kobani and Hasakah and against the Iraqi cities of Habbaniya, Mosul, Makmur, Sinjar and Tal Afar. The comments also come amid recent indications that Washington is ramping up the deployment of US troops and military resources throughout the region. Obama announced just weeks ago that the Pentagon will send an additional 450 ground troops to Iraq as part of plans to establish a new US base and training camp in Anbar province. One day later, the chairman of the Joint Chiefs of Staff, Gen. Martin Dempsey, told reporters that the Pentagon was preparing for additional deployments to Iraq, possibly involving thousands more troops and the establishment of a network of new US bases across the country. In recent congressional testimony, Dempsey and Secretary of Defense Ashton Carter raised the possibility of breaking up Iraq along sectarian lines, and the Democratic Party-aligned Brookings Institution last month published a paper calling for a policy of “deconstructing Syria.” These proposals make it clear that behind the current war in Iraq and Syria is the drive by US imperialism to carry out a new, neocolonial carve-up of the oil-rich region. The US is moving to “accelerate delivery of weapons” to Iraqi tribal fighters, the Peshmerga and other Kurdish militants and the “moderate” opposition to Syrian President Bashar al-Assad, Obama said on Monday. Rather than attempt a legal justification for the war, which has been launched and prosecuted behind the backs of the American people and in defiance of popular opposition, Obama defended his administration’s war policies by boasting of the large kill count achieved by the US-led coalition. “It’s important to recognize the progress that’s been made. We’ve eliminated thousands of fighters,” Obama said, underscoring the fact that it has become routine for the American president to speak of “killing” or “taking out” people around the world. Obama reiterated the US goal of regime change in Syria, declaring that the US would do more to aid the anti-Assad opposition, and adding that “the only way” to end the civil war in that country was to “transition to an inclusive government” without Assad. 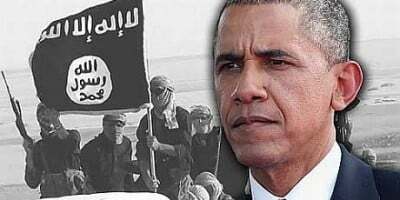 Noting that he had recently discussed the war against ISIS with Russian President Putin, Obama hinted that Putin was amenable to Washington’s plans to topple Assad. He said that the US would step up its counterterrorism operations in countries “from Afghanistan to Nigeria.” This was a signal that Washington will continue its drone strikes, bombings, commando operations and other illegal actions in Yemen, Somalia, Afghanistan, Pakistan and other countries. Obama’s emphasis on the “war on terror” at home made clear that the relentless campaign of the government to sow fear and anxiety among the public in order to justify internal repression and external military aggression would continue unabated.